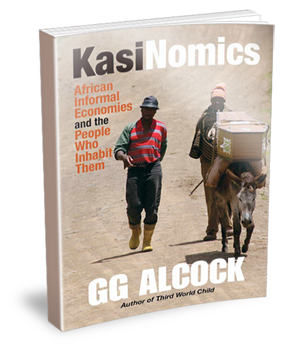 Kasinomics is a book as eclectic, mysterious and colourful as the places and people it explores. That the muti market is worth R3 billion a year, with 27 million consumers? That the average hawker earns R3 000 a month and there are nearly 500 000 of them!? That the trade in goats is worth millions of rand? 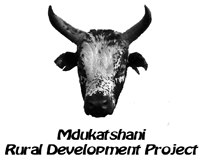 That the dagga trade can set the standard for market and distribution to the informal market? That Parmalat Cheese Slices have created a multi-million rand business in kotas, and why the Perfect Sishebo Show is the biggest food show in the country? eKasi, the lokasie, the South African township, once an apartheid ghetto, is today an amazingly transformed place. This township today is an eclectic mix of mansions, shacks, spaza shops, rocking taverns, hawkers, taxis and hot wheels. In this kasi there are vibrant businesses, energetic people, a tightly networked social community and abundant hope. That is not to say there isn’t extreme poverty, suffering and dissatisfaction, particularly on the peripheries in the huge shack settlements, but to paint the place as a slum is a massive mistake. 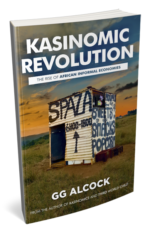 Kasinomics attempts to cast a light on the invisible matrix at the heart of South Africa’s informal economies and the people who live in them. Living and doing business in African marketplaces requires an ethos uniquely suited to the informal, to the invisible, to the intangible. 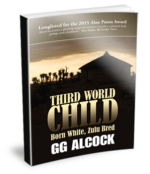 After almost twenty years of focusing on marketing to the informal sector, GG Alcock, CEO of specialist marketing company Minanawe, showcases a number of groundbreaking and very successful case studies in this invisible informal world. His vivid anecdotes and life experiences and how they link to understanding and inspiration for business ideas will make you gasp, laugh and shake your head in wonder.